In the south, we eat a lot of chicken. It is my least favorite source of protein but since we raise our own meat birds, it’s on the menu a lot. 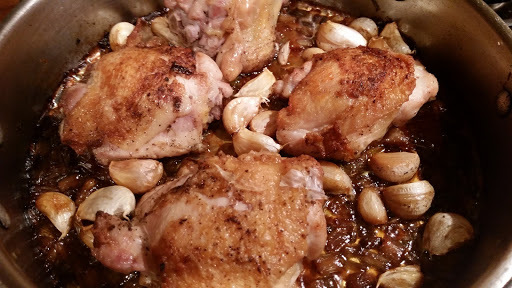 This recipe was adapted from a recipe that called for cooking the chicken with 40 cloves of garlic. In a large oven-proof saute pan, brown the chicken pieces on all sides until golden brown. Remove the chicken from the pan and set aside. Add the scallions and garlic and saute for 2-3 minutes until the veggies begin to release their aroma. Add the brandy to the pan and cook for about 30 seconds. Add the chicken stock and bring to a light boil. Return the chicken to the pan, cover with a lid, and baked at 350 degrees for 1 1/2 hours. I served this with polenta with smoked gruyere and a mushroom ragout.